Bernadette Martin volunteered on a couple of medical outreach missions with Global Healthworks Foundation – primarily to provide Reiki treatments and Level I and II Reiki classes for the Foundation’s health promoters. But once we knew her background, we were fortunate enough to have her also educate the locals about organic gardening, nutrition, farmer’s markets, and composting. Of course, she excels at everything – so she’s a “keeper”! Read all about Bernadette’s story with Global Healthworks Foundation below. 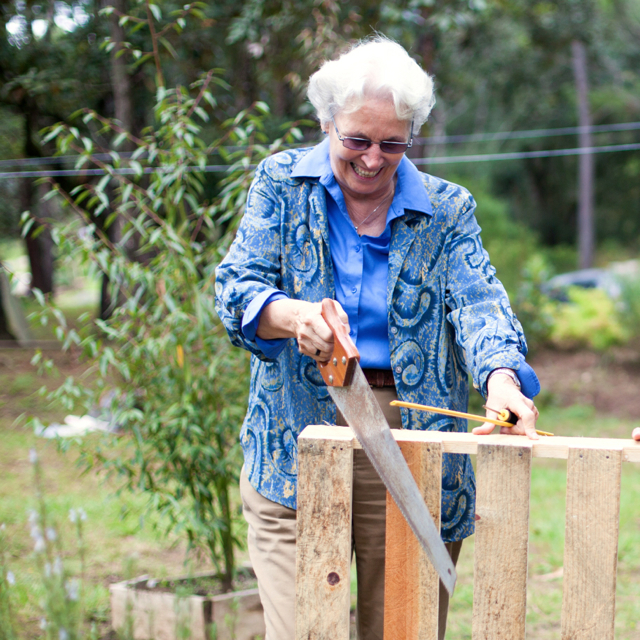 The bin is one of the Centro’s first steps in initiating an organic food and nutrition program. “Nos enfocamos en el tema de seguridad aliment aria (We are focusing on the theme of food security),” says Luciano Laynez, Administrator for the Centro de Paz. “Queremos enseñar a nuestra gente cómo producir los vegetales en una manera muy fácil. (We want to teach our people how to produce vegetables in an easy way. )” In addition, Sister Virginia (Ginny) Searing, the Centro’s Executive Director, says, “We’d like to use the organic fruits and vegetables in our kitchen. Eventually, we’d also like to set up a farmer’s market like the one Bernadette has in New York, so our people can also make an income.” Before that can begin, however, Bernadette, Joel, and Tomás—and his three-year-old son, Vicente, who insists he is “el jefe” (the boss) of the operation—must build a place to house the compost. In about ninety minutes, armed with some screws, a drill, a saw, and six wooden pallets, which Bernadette says are better than any she’s used previously, the team constructs the Centro’s first compost bin. “Don’t be surprised if there are five more when you come back!” Sister Ginny tells Bernadette. 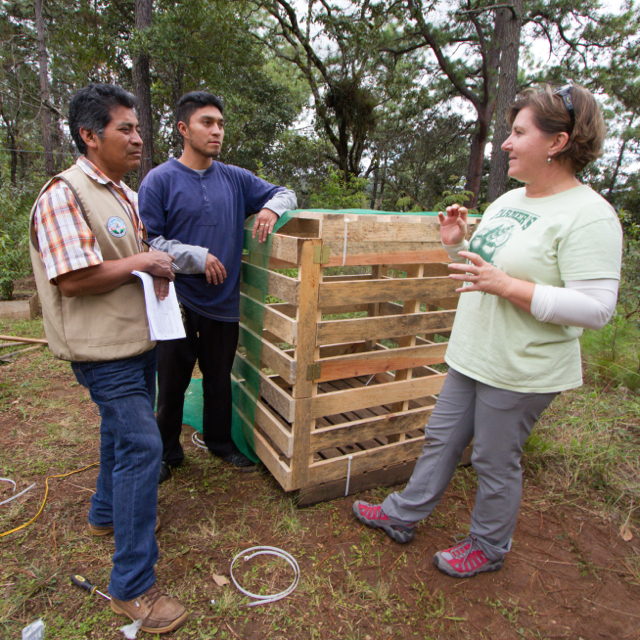 As young Vicente climbs in and around the container—ensuring its sturdiness, no doubt—Bernadette teaches Tomás and Joel the basics of the compost process. “We are creating beneficial microbials,” she explains. “The micros are able to ‘fix’ nitrogen, and the nitrogen is necessary for green leafy growth.” After a quick lesson on layering carbon and nitrogen materials, Bernadette suggests the Centro make a compost “tea.” “¿Un té? (A tea? )” Joel asks, confused. “¿Para tomar? (To drink? )” A bit of the lesson is lost in translation. Bernadette explains more thoroughly through a mix of Spanish, English, and hand gesturing: “Sí. Se puede hacer un té. Pero no para beber. (Yes. You can make a tea. But not to drink.) You put the compost in a thin bag or cheesecloth. Then, put it in a bucket of water. The next day, apply it to your garden, and the plants will absorb it through the roots.” Tomás and Joel nod in agreement. “Muy bien (Very good),” they respond.